aMUSE: Fashion pop-up exhibit held in November 2013 at Mahtay Café and Lounge in downtown St. Catharines. While doing quite well with tourists, older adults and young families, has difficulty attracting and engaging new generations of visitors and supporters. This challenge isn’t unique to the St. Catherines Museum or even museums in Canada – in the United States, studies by the National Endowment for the Arts identified young adult audiences as being regularly under-served by traditional museums. Many museums around the world have been working to address this problem by developing specialized programming aimed at engaging younger audiences. 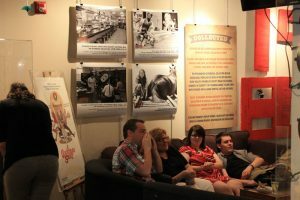 Staff at the St. Catharines Museum grappled with our own unique set of challenges in creating programming for millennial audiences. The physical location of the Museum is a major challenge; located beyond the City’s core and not accessible via public transit, getting young adults out to the site can be difficult – especially when many are unaware that a museum even exists in the City. In order to raise our profile, dispel the perception of the “dusty, old, irrelevant museum” and reach new audiences, museum staff concluded we would have to take the Museum and its collection into the community. Inspired by pop-up shops, flash mobs, music festivals and other social museum experiences, such as Friday Night Live at the ROM and the Nature Nocturne at the Canadian Museum of Nature, the St. Catharines Museum set out to inject the community with artifacts and stories through aMUSE, our curated “pop-up museum experience”. In The Participatory Museum, Nina Simon notes that “every museum has artifacts that lend themselves naturally to social experiences,” and that these artifacts serve to fuel conversation, engage the audience and connect people to both each other and their shared experiences (p. 127). We endeavoured to create our own social museum experience – a kind of mash-up of the pop-up format and a more conventional museum exhibit. To this end, our Curator and Programming team created an event series that would bring rarely-seen artifacts out of storage and into the community for a (very) limited time, allowing the public to see more of our collection in an environment where they are encouraged to interact more personally with both the objects and other event-goers. This proved to be a rather tall order – not only did we need to adapt the social museum event model to be feasible and sustainable in our community, we had to search out partnerships to make the event happen and plan to transport artifacts outside of our facility, often into non-museum spaces. Our pop-up museum was a departure for our organization and required a certain amount of “letting go” of our physical space as well as new ways of working. Our first aMUSE event in May 2013 set the tone and general format for the series; we created a pop-up museum focused on bikes and cycling in St. Catharines. Our event featured 3-D artifacts (including bicycles from the collection), digital projections of archival images, a collaborative art installation to which visitors could add their own bike memories, a performance by a local singer-songwriter and food and drink from our event partner, Mahtay Café and Lounge. We hosted over 120 people at the evening event, many of whom eagerly contributed their own stories of first bicycles, learning to ride, mishaps and adventures to our collaborative installation, which emphasized personal stories and participation. 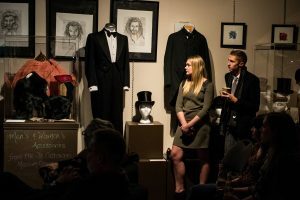 While the core of our audience was our target demographic, we also hosted high school students and older adults, demonstrating that pop-up museums have a wider appeal than we initially thought. aMUSE Collected: 1980s installation at Mahtay Café in June, 2014. In terms of revenue and museum metrics, aMUSE wasn’t designed to be a money-making program, it’s purpose was and still is to raise the profile of the Museum, engage the public in new ways and cultivate future audiences. In the interests of accessibility, all of our aMUSE events are by donation/pay what you can and while we’ve collected modest donations, the series hasn’t been a major source of Museum revenue. We’ve tracked attendance as well as in-person and online engagement with our aMUSE project and used these as our primary measures of success. For the remainder of our first season, we were able to build on collection strengths, with broad topics that had demonstrable traction among our target audience. However, in planning for our second season of aMUSE, our cataloguing backlog posed some significant challenges in devising appropriate exhibit themes – we have no shortage of objects in the collection, but are limited to those that are stable enough to be displayed, able to be transported and are fully catalogued and entered into our database. We went broad for our second series, which allowed for more flexibility in choosing objects for our exhibits. Our series two theme was ‘collected’ featured a cross-section of the Museum’s holdings, showcasing the diversity of the Museum’s collection. We continued successful elements from the previous season – 3-D and photographic content for our exhibits, participatory elements and performances from local musicians. Learning from our first year, we toned down the programming elements –our audience preferred passive, personalized and self-use activities to highly structured experiences. In our third season of aMUSE, we were able to realize a goal of our original pop-up museum concept – take our event to a variety of locations throughout the City. While we had hoped to implement a more mobile aMUSE right from the start, cultivating partnerships took a significant amount of time, especially when the idea we were selling was new and very much an unknown quantity. aMUSE: Sideshow popped up on James Street in downtown St. Catharines as part of 2015’s In the Soil Arts Festival. In 2015 we tested the waters, combining events at Mahtay with daytime pop-up events at Brock University, In the Soil Arts Festival and the St. Catharines Farmers Market. In response to the feedback about the unclear and sometime confusing theme of our second series, we decided to abandon strict themes and go for more of a feel or vibe; “Sideshow”, which corresponded with our more mobile, nomadic series format and gave us the freedom to use a wide variety of artifacts and images. For our fourth and current season, we’ve really taken aMUSE on the road, with events at Rodman Hall Art Centre, In the Soil Arts Festival, Lakeside Park, and the farmers market. We’ve continued to experiment with highly visual, place-based exhibits as well as using elements of the catalogued Museum collection in new and unexpected ways. The aMUSE series has changed theme and format over its short life, but at its core, our pop-up museum series continues to share unique community stories and engage a new audience of active museum supporters. Meredith Leonard holds a Master of Museum Studies degree from the University of Toronto and a Master of Science in Adolescence Education from D’Youville College in Buffalo, New York. A certified teacher, she is currently the Visitor Services Coordinator at St. Catharines Museum and Welland Canals Centre. Meredith is one of the founders of the award-winning pop-up museum series, aMUSE and was selected as a 2015 fellow in the Getty Leadership Institute’s NextGen Program. For our purposes, we defined millenials as, roughly, those between 19-35 years of age. The Denver Art Museum’s report “Creativity, Community and a Dash of the Unexpected: Adventures in Engaging Young Adult Audiences” provides great insights into working with and programming for younger audiences. This pop-up was a repeat theme for a community farmers’ market. 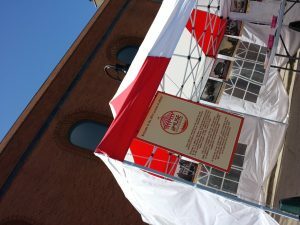 The community association running the market wanted to have an option to engage families passing through the park and market, and reached out to MPM for a pop-up museum.